Heres William Shatner aka Captain James Kirk of the starship USS Enterprise NCC 1701 battling with the babe advances of Nichele Nichols aka as Lieutenant Uhura who needs no introduction as the most talented linguistic tongue and communications officer in Starfleet. 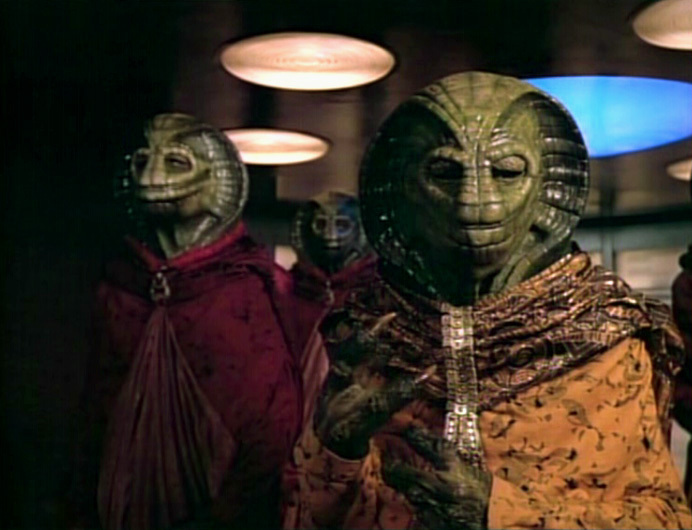 Remember Plato's stepchildren in Star Trek The Original Series? Well, Kirk and Uhura embraced passionately for the first time ever with an inter-racial kiss on prime time television which aired on November 22, 1968. Of course kissing was all part of the script and hey, Uhura is a really hot babe on the original starship Enterprise with a voice to melt hearts too. At the time this "first kiss" aired inter-racial relations was a very big deal for the United States, Paramount Studios and TV broadcasters, however time has eventually caught up with these old rascals. "Don't push your luck Kirk, once was enough! It might seem hard to believe that these Star Treks heros were once slobbering all over each other but its true. I not sure who looks more petrified. Tragically for Shatner the perks that came with the captain's job 5 decades ago have taken a dramatic turn.. 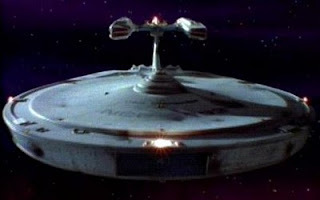 The Battle is the ninth episode in Star Trek TNG written by Larry Forrester and Herbert Wright, directed by Rob Bowman. The USS Enterprise NCC 1701 enters the Xendi Sabu Star System where it waits patiently for three days at the request of a mysterious Ferengi message, "Stand by, Enterprise." Meanwhile Beverly is in the captains quarters aboard the USS Enterprise-D servicing a grouchy, bedridden Captain Picard completely drained from a unnatural headache. For a moment its looking real cosy between them. Picard's oratory defenses fail him making him powerless to spurn the advances of Beverly's Crusher's inept administrations. The Chief Medical Officer of the Enterprise takes pleasure ordering the captain to sickbay. You can blame Q for the "inept" bit. Captain Picard puts on a big brave face and is prepared to accept his fate when Commander Riker's hail spoils all the good fun. The Ferengi are finally ready to talk shop with Picard who makes a quick getaway from Beverly's diabolical concoctions and she knows it! So off he goes to the bridge which gets Crusher temporarily off the hook. Consider, why doesn't the Chief Medical Officer just shoot the captain with a few drops of cordrazine which has been known to rejuvenate countless Starfleet mortals? I suspect Doctor Beverly was bluffing and wanted an excuse to well ehm...you know, roll about in the hay with her Captain! !...How very naughty of her, but you never know. Maybe just maybe, she gets off torturing her patients in a roleplay scenario...with the weaker ones who can't fight back! Hehe....Still, she doesn't give up hope on mon capitan and we see the two lovebirds meeting up later on in Sickbay for another round of Crushers "medical fakery." Picard finally gets to talk with one of the beastly little Ferengi creatures calling himself "DaiMon Bok." 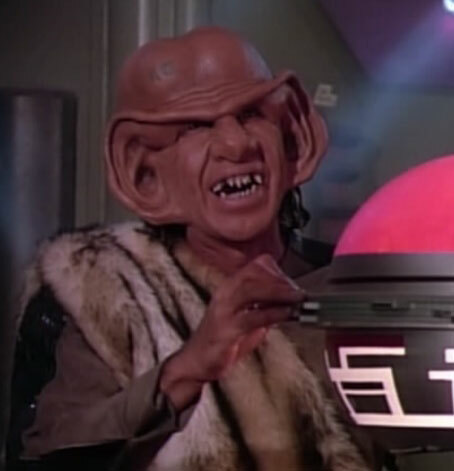 The commander of the Ferengi marauder, Bok makes his sales pitch and arranges to rendezvous with the USS Enterprise and beamover in one hour. 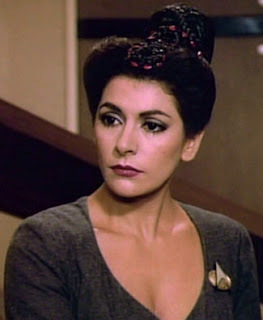 Its interesting to note Counsellor Deanna Troi cautions Picard that she detects "considerable deception on Bok's park and danger" I guess Troi is having a good betazed day! At last Bok presents Picard with his old Federation starship, the constellation class USS Stargazer last commanded by Jean Luc Picard nine years ago in Maxia Zeta. 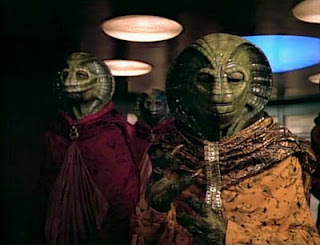 I have to admit, its just too hard to swallow the Ferengis lame story with the little toads behaving themselves just totally out of character. Its all wrong. Counsellor Troi should have chimed in with "Captain the Ferengi toads are hiding something..." right? Ferengis are extreme capitalists at heart and beam straight aboard the USS Enterprise-D bridge. The mind twister here is why Bok donates the Stargazer for absolutely no financial gain? His unprofitable venture was enough to freak out his Ferengi playmates and violate the Ferengi Rules of Aquisition. It obvious to viewers everywhere that this little toad was definitely not on the level. I guess its a little difficult to fully appreciate the Ferengi approach to commerce ... wait I've changed my mind.... Actually trekkers, forgive me but I'm just having a laugh. One thing is certain, interpreting their facial expressions immersed behind all their makeup gew is a challenge for any dedicated trekker. At least "the battle" elevates their characters to a degree of prominence surpassing the Ferengi caricatures rolled out in Star Trek TNG in "the last outpost" episode. In the course of Picard's, Data's and Riker's exchange with the hob goblins it emerges that Bok's son was killed during a surprise attack when the Stargazer outwitted "an unidentified craft" with the exceptional 'Picard Maneuver.' The captain of the USS Enterprise NCC 1701-D apologizes but alas his words are in vain and fall on the dumb ears of the Ferengi. The game is afoot when evil DaiMon Bok played by Rob Bowman gifts Picard's old ship in an act of friendship at no cost to the Federation! Strange but true. Bok's greedy eyed companions are mortified but DaiMons peaceful overtures blows away Picard who can't take his eyes off the Stargazer. Lets face it, Picard isn't exactly firing on all thrusters. Dr Beverly Crusher has already applied a counteragent to "mask" Picard's headache but sadly it just doesn't do the trick. If only Dr "Bones"McCoy was around, I'm sure his Saurian Brandy would work wonders. The entire bridgecrew of the flagship Enterprise actually entertain DaiMon Bok's bountiful Ferengi spirit. I mean whats the matter with them? Are the Enterprise bridge officers juiced up on crack cocaine? All except maybe Commander Riker who attacks Kazagos greedy capitalist beliefs to the extreme limit. "Enterprise now taking possession of the Stargazer, Kazago. "The Ferengi first Officer has little choice but to part with his Federation prize.. "Granted Riker" But Riker persists. 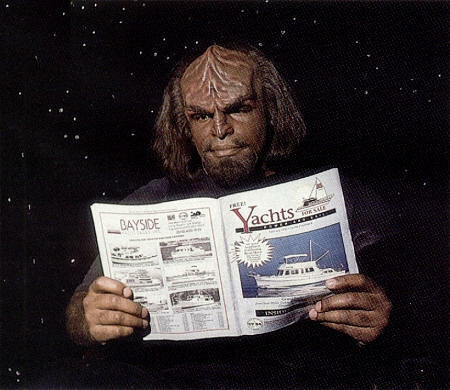 "Actually it was quite a bargain Kazargo, I thought the Ferengi always made a profit on things." beams Riker cruelly at the wolfish looking Ferengi. Kazago ends the transmission with a sickening growl from his stomach. The Enterprise takes possession of the USS Stargazer NCC 2893 "in honor of the hero of maxima" but the scoop just seems too good to be true. The news overwhelms beleagured Jean Luc Picard who finds himself in Crusher's Sickbay with yet another setback. Meanwhile Commander Daimon Bok has been busy. The sneaky toad has hidden a glowing mind control device in Picard's old Stargazer quarters. The magic ball treatment is all part of Bok's elaborate scheme to mortally wound Picard for snuffing out his son! Bok boosts the signal controlling Picard nightmares with his glowing ball of evil. He nearly drives poor baldy beserk with headaches. Amid the chaos of mind control devices, Wesley's geeky predictions, forged Stargazer log entries, Riker and Data playing Detective Inspector Columbo, friendly Ferengi peace offerings and a nostalgic Starfleet captain, Bok's revenge plan to lure Picard aboard the USS Stargazer pays off. The Hero of Maxima relives his past in a desperate struggle to save the Stargazer and her crew but sadly Picard loses all sense of reality. The Enterprise-D captain is aboard his old starship giving orders to former crewmates as they fight for survival in the battle of maxima. Next, Picard sets his sights on the USS Enterprise-D. Take a deep breath Trekkies because we're blessed to withness a sensational strategist sit into the Enterprises captains chair. Fortunately for the crew Commander Riker doesn't blow it. He knows about the celebrated Picard Manevuer used in the original battle allowing the Stargazer to be in two places at once with the attacker firing upon the phantom starship. Good old Riker fails to turn the Federation's flagship into a fireball....what a relief!!! and manages to seize the Stargazer in a tractorbeam before all hell breaks loose. Its a sweet ending when swashbuckler Riker emerges as the hero and seeing the captain Picard bounce back to reality after his trippy Stargazer sleighride. What type of literature does Lt. Worf from Star Trek The Next Generation enjoy reading? 1. The quotations of Kahless the Unforgettable. 3. Science fiction novels by Earth author Isaac Asimov. 4. The Irish Unification of 2024. 5. Hodgkin's Law of Parallel Planet Development. Lonely Among Us is the sixth episode of Star Trek The Next Generation written by D.C. Fontana and Michael Halperin directed by Cliff Bole. Stardate 41249.3. The U.S.S. Enterprise NCC 1701-D beams aboard delegates from two alien civilizations in the Beta Renna system who have become deadly adversaries. Since achieving space flight the Seley and Antican lifeforms have naturally applied for Federation membership. In the Enterprise transporter room, Captain Picard, Commander Riker and Chief of Security Tasha Yar patiently await the arrival of the Seley delegation to beam up. The snake creatures materialize with the chief Seley delegate stepping off the transporter pad sniffing the air. "I'm Captain Picard, welcome aboard. We hope your journey will be pleasant and comfortable, arranging that will be my First Officer, Commander Riker." Riker: "Welcome aboard. If you follow me, I will show you the accommodation that we....."
Chief Seley Delegate: "We can already smell the Anticans. They were taken aboard first?" Rikers mouth falls open in complete shock. 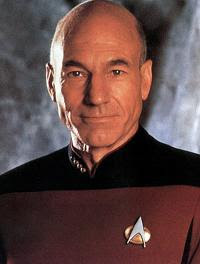 Picard steps in to the rescue: "Only because their world was first on this heading to Parliament." Chief Seley Delegate:"Will our quarters be near the Anticans?" The creatures nervousness resonates throughout the transporter room. 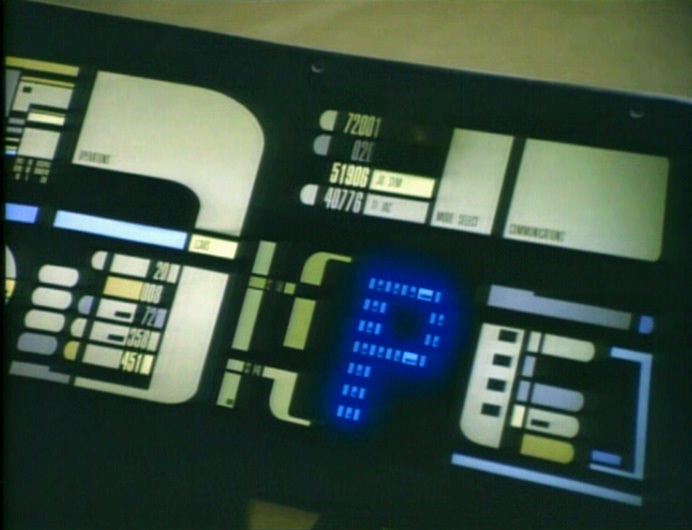 Riker: "About one hundred meters appart." Picard:" Is that alright?" Tasha Yar makes an effort to keep a straight face. Chief Seley Delegate:"No! Unsatisfactory." The Seley delegate is extremely peeved about the guest quarters. Riker:" I believe we can accommodate your wishes and rearrange the suite assignments." Chief Seley Delegate: " And we must be upwind from the Anticans." Tasha Yar and Picard realize that the Seley and Antican candidates have a serious beef with each other which is in danger of spiralling out of control. Its the Enterprise's job to deliver the aliens safely to the neutral conference planet. The hope is Parliaments Peacemakers will get the aliens to play nice with each other before establishing ties with the United Federation of planets. 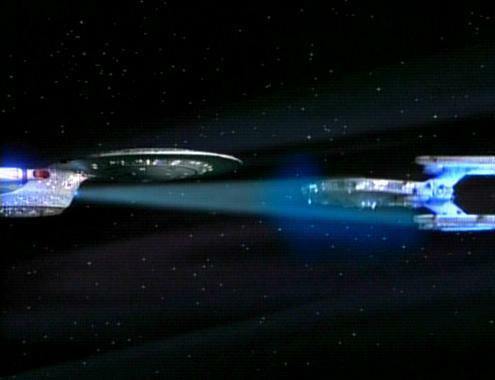 Meanwhile on the Bridge, Data's shortrange scanners detect a mysterious energy cloud closing in at warp speed. Captain Picard tweaks the USS Enterprise NCC 1701-D flightpath in order to bypass the cloud so they can reach parliament on time. However all is not what it seems. Routine maintenance on the ships sensor assembly seems peaceful enough with Geordi reporting all sensor maintenance equipment online and functioning. Perfect! Right? Guess again!!!! The Enterprise's plight deepens when Data's bridge sensor scanners reveal absolutely no lifeform or matter readings emanating from within the energy cloud. When the Enterprise sweeps by the edge of the mysterious space phenomena, something far-out happens. It changes shape and direction! Why the ship's sensors got it wrong only adds to the mystery. A sentient energy life pattern is accidentally snatched away from its natural habitat and absorbed through the USS Enterprise NCC1701-D energy systems. Clueless, Starfleet's finest continues on their way to Parliament. Alone and terrified the energy sentience tries to communicate with the Enterprise crew, alas it's met with resistance and very strange behaviour. 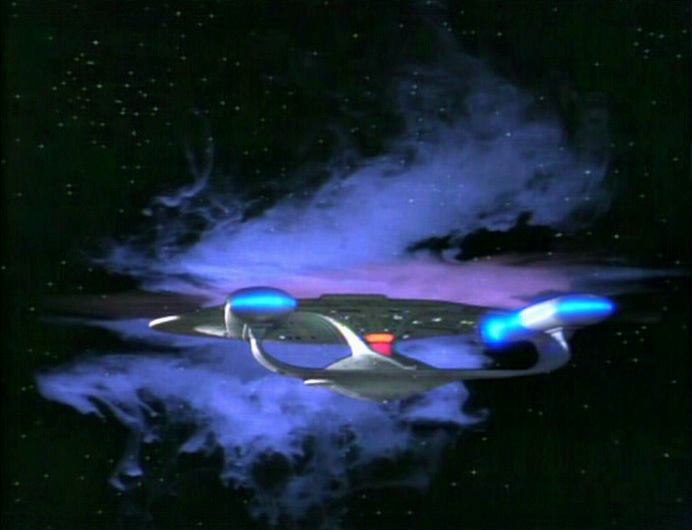 The energy beings sentience is temporarily trapped in the Enterprise-D energy circuitry so it devises a plan to emerge with the human lifeforms on the Enterprise thing. During the sensor sweep of the mysterious cloud a blue energy surge attacks Lt Worf during his routine inspection of a sensor console. The energy being leaps into the Klingon sending him crashing to the deckplates unconscious with quite a wallop! This is a brilliant stunt played out by the great Klingon Warrior Lt. Worf aka Michael Dorn and is thrilling Star Trek to watch. 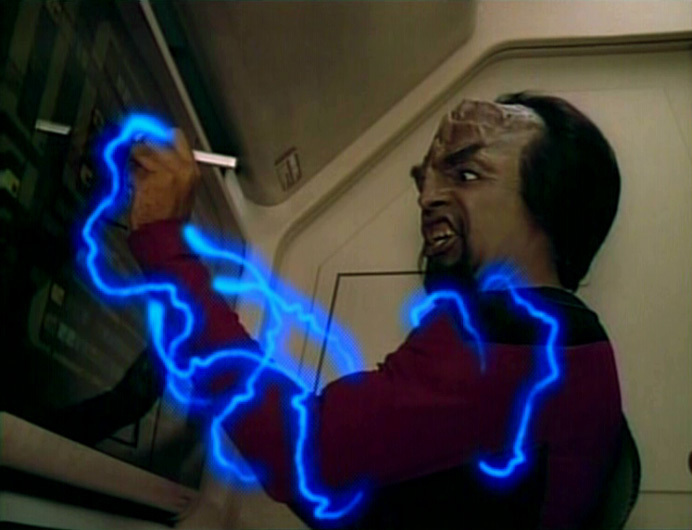 Geordi springs into action and alerts Dr. Beverly Crusher who also gets a zap from the weird and mysterious entity. Equally weird is the fact no-one notices the Doctors oddball behaviour including the empath Troi. Finally, our sentient energy being discovers the Enterprise's computer intelligence with the help of Dr Beverly Crusher who nearly blew it. On the bridge Data spots her assessing Helm Control instead of using the Science Station for completing a medical report on Lt Worf "Mental Aberrations." Datas android innocence fails to detect the doctors seeds of evil and expose her as a baddie! Later on further warp power disruptions affect the Enterprise so Captain Picard leans over Geordi's Helm station which immediately infects him with a blast of blue energy. "Everything is fine now." The alien energy being has big plans for Picard. It intends creating a new lifeform by merging him with the energy cloud. Yikes! "The search for knowledge is always our primary mission." In my view Dr Beverly Crusher fails to assert her authority over Captain Picard as Chief Medical Officer of the Enterprise when he first exhibited signs of alien possession in the Ready Room. Why didn't Beverly just whisk out her Medical Scanner and analyse Picards vital lifesigns? Instead the good doctor goofs around with medical exams counting on Commander Riker to back her up "somehow." On the Bridge more chaos shocks the crew when Captain Picard announces his resignation in the face of Riker's defiant objection. The sentient entity being is responsible for sabotaging the ship, invading the crew and apologizes for killing Engineer Singh but its alien mind is resolute. So that leaves Picard to deliver the bad news to his senior bridge officers. But hey! what a speech even though its crazy B.S. Its so eloquent and dignified in substance that everyone is temporarily stunned into silence. "Very soon after we had combined we had learnt much about each other. A passion for exploration and the unknown and we found we had similar dreams. It offered your captain a way to realize them beyond human expectation." The USS Enterprise NCC 1701-D bridge crew rise up against the captain but the sentient entity is ready for them with his secret jedi weapon. 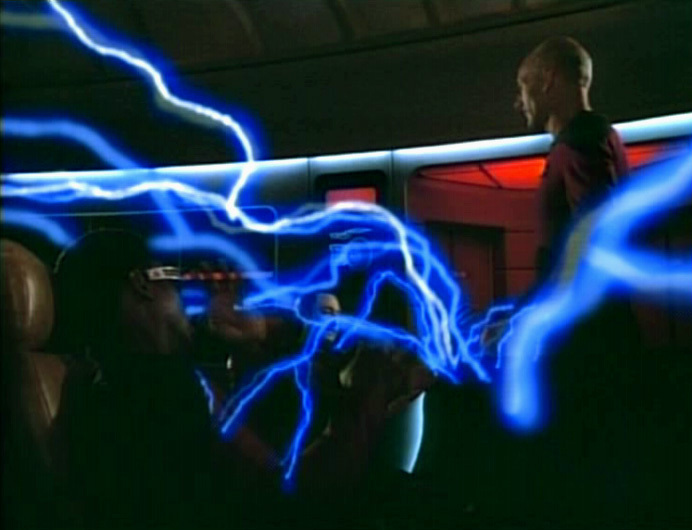 He immobilizes the entire bridge crew with blue flashes of lightning which gave him enough time to flee the ship. Captain Picard merges with the energy life pattern by beaming out as pure energy into the alien energy cloud. Don't you just love new lifeforms? Counsellor Deanna Troi senses something has gone wrong when Picard's energy presence is abandoned by the aliens in the energy cloud. "The merging" with the energy patterns was a complete failure. Fortunately the captain's physical energy pattern was stored in the transporter buffer and because he was the last one to leave the ship.....Data, Riker and Troi are able to rematerialize the captain in body and spirit and proceed to Parliament minus one adorable Seley delegate.